There's nothing unusual about sharing pictures of your pet or dancing with your pet. In rare circumstances it might even be OK to shower with your pet. But one man who did all these things with his pet raccoon found out the hard way… it is illegal to keep a wild animal as a pet. Should he get her back? The raccoon controversy makes tonight's RidicuList. Hannah Anderson turns to social media to speak out about her abduction by James DiMaggio. On the web site Ask.fm, Anderson says she didn't run away because, "he would've killed me." Is it troubling that she decided to be so candid in such a public way so soon after her rescue? Rebecca Bailey is a therapist who treated Jaycee Dugard after her rescue. "Welcome to Chicago." A Bronx cop using that quote to set off a war of words with the Windy City over stop-and-frisk. Chicago is dealing with a surge in murders that set off a national debate over handguns. Now some police in New York City are suggesting the ruling that declares stop-and-frisk unconstitutional will send the crime rate soaring there. Anderson took a closer look at all of this with Philadelphia Police Commisioner Charles Ramsey, conservative blogger Crystal Wright, and criminal defense attorney Mark Geragos. The deadly violence in Egypt poses a significant challenge for U.S. foreign policy. Secretary of State John Kerry called today's fighting deplorable. Now the U.S. military is considering calling off plans for joint military exercises with Egypt. Did the Obama administration miss an opportunity to stop this violence? What needs to be done now that hundreds of people are dead? Anderson discussed all of this with CNN's Ivan Watson, National Security Analyst Fran Townsend, and Daily Beast Correspondent Peter Beinart. Hundreds of people die as a wave of street violence sweeps across Egypt. The majority of those killed were members of the Muslim Brotherhood and supporters of ousted President Mohammed Morsy. In addition, dozens of police officers were also killed in the fighting. This latest violence began when security forces raided a camp full of Morsy's supporters in Cairo. CNN's Arwa Damon got close to the fighting earlier today during her reporting. Anderson spoke to her from Cairo. Editor’s Note: Join us at 10 p.m. ET tonight for the developments from Cairo. Anderson will talk with CNN’s Arwa Damon and Ivan Watson. Hundreds of people are dead after Egyptian security forces unleashed a deadly crackdown today to clear camps filled with supporters of ousted President Mohamed Morsy. For weeks, the interim government has vowed to crush the demonstrations. They made good on that promise with a chaotic and bloody operation that began at dawn. Security forces stormed two massive makeshift camps in Cairo, using bulldozers to tear down tents. CNN’s Reza Sayah reports that authorities claim they initially used tear gas and water cannons to break up the protesters. They say Morsy protesters fired their guns first and they were forced to fire back. The gunfight went on for hours in Cairo, and the violence spread to other cities. U.S. Secretary of State John Kerry condemned the violence. “Today's events are deplorable and they run counter to Egyptian aspirations for peace, inclusion, and genuine democracy,” he said at a news conference in Washington. The number of civilians killed today, according to Egyptian TV. 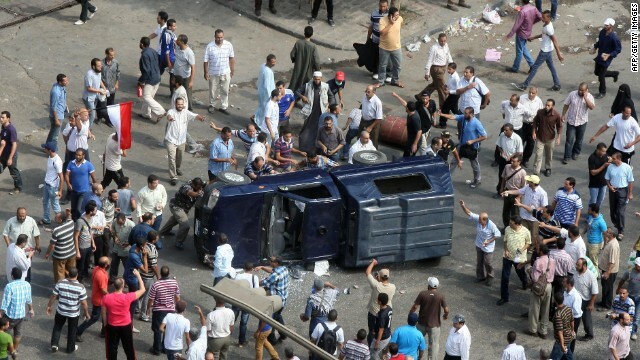 The number of Egyptian policemen killed in clashes today, according to the Egyptian Interior minister. The total number of deaths across Egypt today. That’s the number of camps raided in Cairo. Egypt’s vice president of foreign affairs, Mohammed ElBaradei, is the one member of the interim government to submit his resignation today. However, it was not accepted yet, according to state- run TV. Egypt declared a one month-long state of emergency beginning at 4 p.m. (11 a.m. ET), according to state television. The year Morsy became Egypt’s first democratically elected president. Morsy’s age when his birthday takes place on August 20. Egypt’s estimated population, according to the CIA World Factbook. The country’s estimated unemployment rate, according to the CIA World Factbook. The amount of economic aid from the U.S. to Egypt each year, for health, education, and democracy programs. The amount the U.S. gives in military aid to Egypt each year, much of it for equipment such as tanks and fighter jets.